Since starting our vintage wedding car hire business a few years ago, we have been privileged to chauffeur many bridal parties throughout Dumfries and Galloway, and beyond. In the process we have been lucky to discover several wedding venues we wouldn’t otherwise have been aware of. 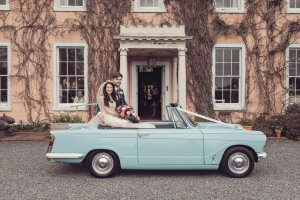 So we thought we would put together a list of some of our favourite, and in our opinion most photogenic – especially with a classic wedding car sitting outside! Argrennan Manor House, holds a special place in our hearts, being the first reception venue we were involved in. With its stunning Georgian exterior and idyllic setting of ornate and walled gardens, any photographer would be in their element. Smaller, more intimate weddings can be catered for in the elegant interior, while a marquee can be erected on the lawn for larger parties. Craigadam House Hotel is an impressive Georgian farm house, set on its own estate, just 25 minutes from Dumfries. As with Argrennan, a bride and groom can choose from an intimate reception inside, or have a larger reception in the marquee, which sits on the hotel’s stunning courtyard, with its beautiful fish pond as a centre piece. Very practical for high heels and chair legs! 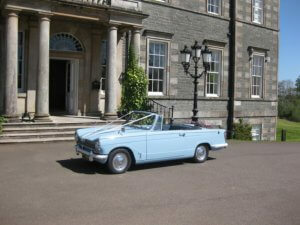 An added bonus is the wedding party gets exclusive use of the hotel, with accommodation for up to 20 people. Low House, is not actually in D&G, but just one hours drive from Dumfries, in Armithwaite, Cumbria. Again it is a beautiful country house venue, with weddings being run by the same family who have lived in the house for generations. The outside of the house is clad in Virginia creeper, which must be particularly stunning in autumn. As with the previous venues, smaller and larger wedding parties can be catered for, and they also have a licenced gazebo, if you would like your ceremony to be held at Low House. 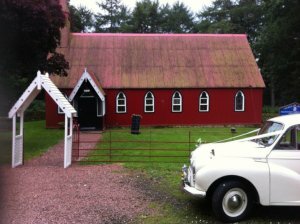 Kirkandrews Kirk – “The Wee Kirk”, near Borgue, Kirkcudbright is perfect for a couple who would like to get married in an uniique and intimate setting. The kirk will only take up to 50 people, but seats can also be arranged for even smaller numbers. This unique church was completed in 1906, and is one of several buildings built in the area in the Arts and Crafts Movement style. You are welcome to choose your own minister to conduct your wedding ceremony, the kirk is open to all denominations and faiths. Dalswinton Church – The Barony Church is just 20 minutes from Dumfries, and is another unique place to have your wedding ceremony performed. Incredibly, it was ordered from a catalogue as a flat-pack, and built in the grounds of Dalswinton Estate in 1881. Again, this church non-denominational, but is larger and seats up to 150 people. This little red tin church makes for the most stunning photos. 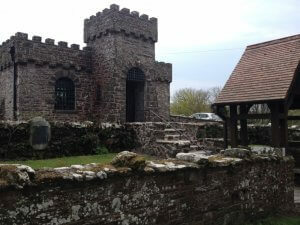 Worth mentioning as well, is Dalswinton Village Hall, just a stroll down from the church. 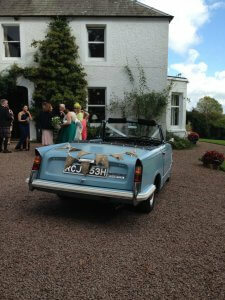 We have seen a bride and her groom being piped down the road, followed by their guests sipping champagne. Perfect set up for a relaxed, traditional family wedding. The hall built in 1926, has recently been completely refurbished, and is surrounded in lawns to enjoy. Inside, there is even an open log fire ideal for cosy winter weddings or even cooler Scottish summer evenings! Dalswinton Estate Weddings are held just a few minutes drive from the church and hall. It started as a wedding venue in 2018, and looks likely to be a very popular venue. The spectacular marquee is set in a beautiful walled garden, surrounded by rolling countryside, and even has its own lochan and “castle” folly. As we say the marquee is particularly spectacular with its clear sides and top – so those stunning views are not hidden.